Now Forged! The same great link is lighter and stronger with a forged core just like OEM. Forged, CNC machined 6061 aluminum arms and forged steel outer bushing rod end. Machined steel adjusters e-coated. ±1.5° typical camber adjustment via double adjusting threaded sleeve-on-stud design. Jam nut and pinch bolt provide adjustment retention Links are capable of greater adjustment with our #1 links that sit on the front side of the upper link. Includes mounting bracket for the ABS wheels speed sensor. OE style bushings to maintain factory ride quality (replaceable). Polyurethane performance bushing options for lifetime service and greater suspension efficiency. Remove factory components including ABS bracket and inner and outer hardware. 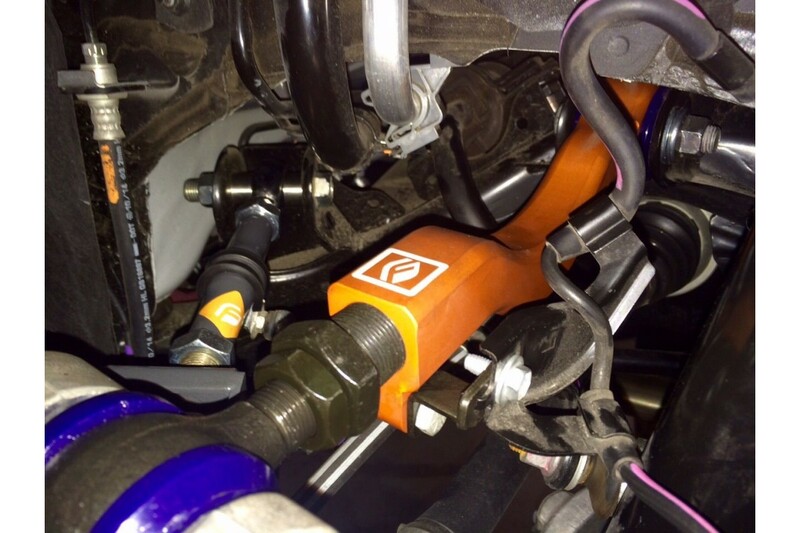 If not pre-assembled, attach supplied ABS adapter bracket on pinch bolt and insert into pinch bolt hole with bracket oriented towards the rear of the car noting the arm's curved portion will be pointed down . Set new FIGS Arm such that the outer bushing and adjusting nut are completely threaded into the arm. 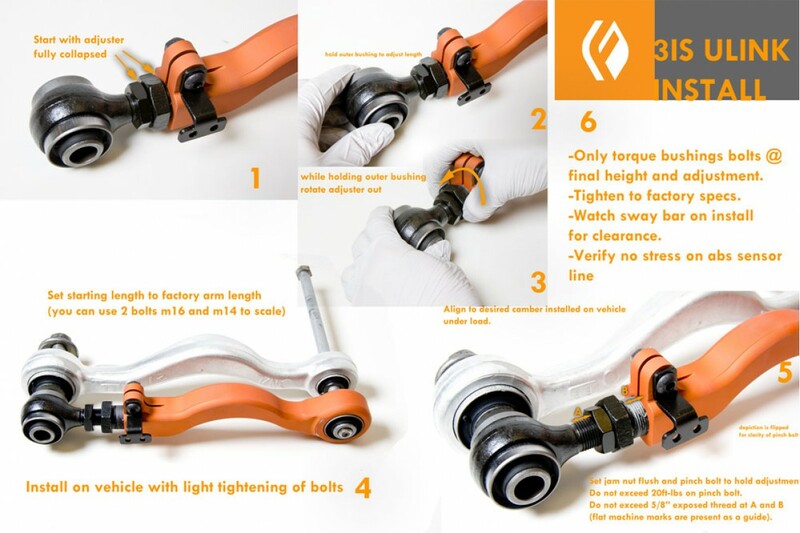 Note: It is okay if the forged link holding the bushing may stop before the threading is all in the arm. While holding the outer bushing, unscrew the large 32mm adjuster nut until arm length is approximately the same as stock arm. You can use 2 bolts to properly gauge length. Be careful not to rotate the adjuster nut or outer bushing. This guarantees maximum adjustment range. Install arm onto vehicle with arm curving downward. Install stock bolts and lightly tighten. Do not apply final torque until the final step. Using the factory bolt attach the factory ABS bracket to adapter bracket. Install tire and wheel assembly and lower vehicle. 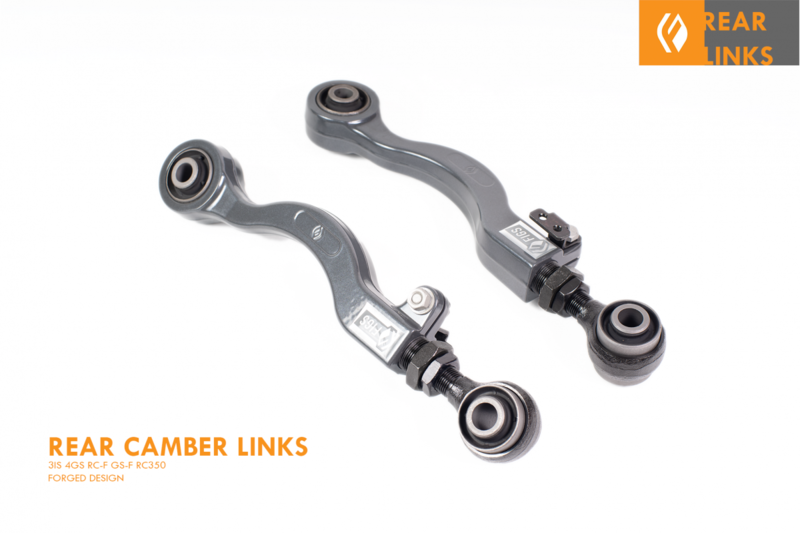 Adjust camber by turning the 32mm adjusting nut until desired camber is reached. Warning: the gap between the large adjusting nut and the outer end of the arm should not exceed 16mm (5/8”), measurement “A”- Figure 1. Exceeding the range of adjustment may cause the arm to fail and void the warranty. Tighten small pinch bolt and nut to 20 lb-ft. Tighten jam nut against adjuster nut. Adjust rear toe, recheck alignment and road test vehicle. Always check for proper clearance between suspension components and other components of the vehicle. The final step is to tighten the bushing bolts to manufacturer's specifications. Make sure suspension is fully loaded before tightening the bushing bolts if not they will be under preload and wear out prematurely. EXHAUST MADE TO ORDER - LEAD TIME 3-5 WEEKS OUT AT THIS TIMEOne of the first mods most people do to..